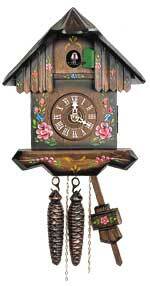 11 inch 1 day chalet style cuckoo clock by Hekas with wooden moving beerdrinker, wooden hands and cuckoo bird. Clock features a night shut off as well. Roof is made of handcut wood shingles. 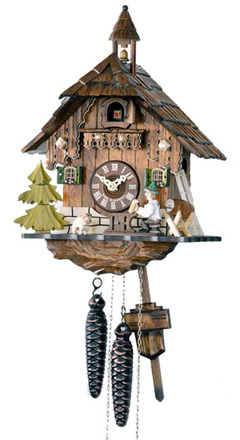 This cute 9 inch chalet features a moving chimney sweeper, who pops out every time the cuckoo calls. 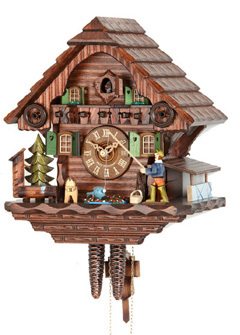 This 9 inch chalet style cuckoo clock by Hubert Herr is absolutely gorgeous. The handpainted flowers and wooden dial give the clock a antique look. 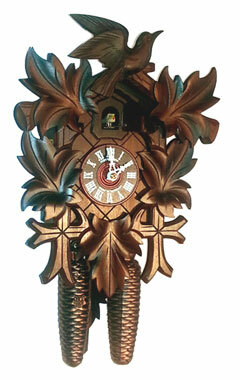 Clock is handpainted and handcarved.